Well the past couple of days I've spent trying to get my house in order. My 20 year old niece is coming to live with me. She's had a really rough life so far. So she asked if she could come to GA and is on her way right now. She'll be here in an hour. That means trying to get her room set up so that she'll be comfortable. I'll be honest I'm excited and scared at the same time. I really hope that I can help her but I haven't been in the best frame of mind. They say the best way to help with the grieving process is to try and help others and I'm choosing to believe that we can help each other. If you could say a prayer for both of us, I would really appreciate it. It's going to be an adjustment for everyone but I think we'll be ok.
Anyways on to the card. I got to spend a little time creating a new Easter Card. I found this gorgeous paper and just couldn't wait to do something with it. This is a card for my Mingle partner so hopefully she's not looking. lol I hope everyone is having a wonderful week. Ooooh this is SOOOO pretty! I love the ring of pearls...just beautiful! Praying all works out for you and your niece. Your card is awesome!! It is so bright and clean looking. Tilda is beautiful!! Love the 'window' you have created. Gorgeous papers and all your embellishments are just great! Your Tilda is so pretty all dolled up in pink! lovely creation Julie! Beautiful card! I love how you did it so it almost looks like a picture frame. Wonderful work. Your card is delightful! The colors are great, your coloring is awesome and that layout just perfect! 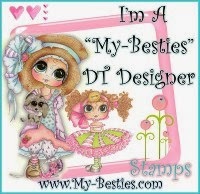 Love this adorable card of yours! I think your niece coming around would bring some comfort to you and it is always a good thing to help the others. Just have faith. You betcha - I am praying for you and with you and if you don't mind me saying so - but this sounds so needed for both of you guys. My heart and prayers go with you. And by the way, your card is absolutely gorgeous!!!!! Julie, this is a totally gorgeous card. Love the frame and the layout is so pretty. Beautiful card. You and your niece are in my thoughts and prayers. Good luck. 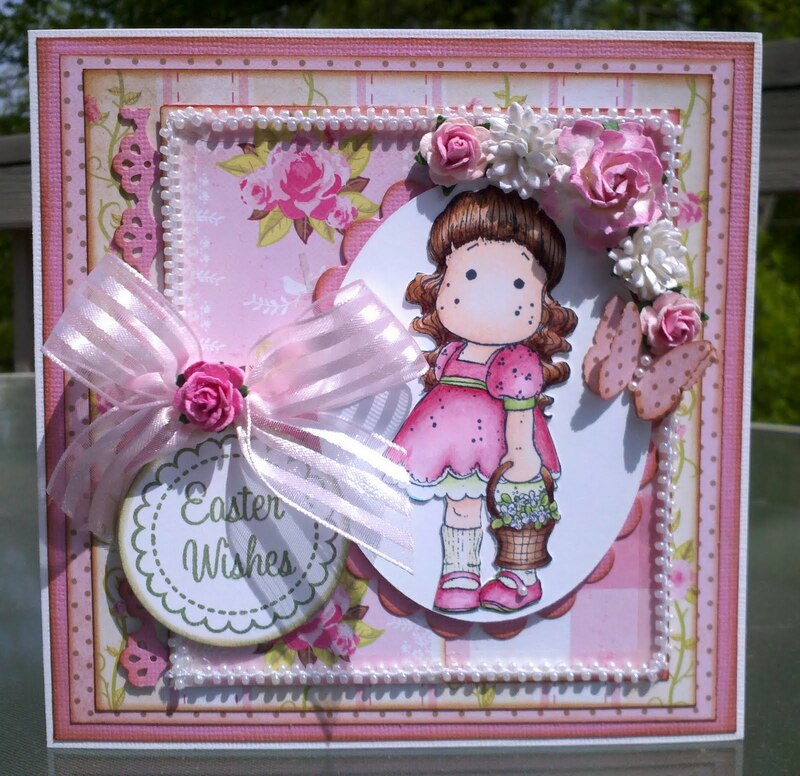 BEAUTIFUL Easter card, Julie! I love the layout, colors, your coloring, the pearls, the butterfly...everything! I'm sure everything will work out just fine between you and your niece...you have a big heart. This is such a beautiful and sweet card! The ones we lose can never be replaced, but hopefully you and your niece can help each other to heal. What a beautiful card! I am sure it will work out with your niece and how nice of you to let her come and live with you. Maybe a new stamping partner. I have not received my candy yet but as soon as I do I will let you know. I just didn't want you to think I had not thanked you. Wow beautiful creation yet again!!!! I love the pink my favorite color and tilda is so cute!!!! really pretty card!! love the embellies and your coloring! Hi Julie, your card is beautiful, so sweet and pretty, just perfect. I just popped over to thank you for entering my birthday candy, apologies it's taken me so long it's been hard to keep up with everyone. I'm glad I stayed and made myself at home here for a while, your blog is absolutely gorgeous Julie. I am so sorry to learn of your tragic loss of your beautiful angel, I can't image your pain and to be totally honest I wouldn't want to, the thought is just unbearable.